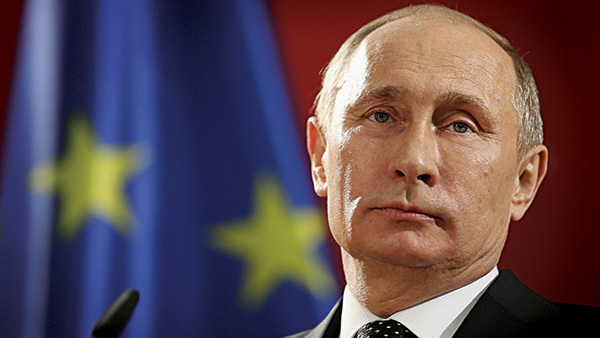 Russia faces a growing strategic and economic dilemma. The United States didn’t seek confrontation with Moscow. On the contrary, it cheered when Russians rejected Communism in 1990 and, over the past 25 years, different U.S. administrations tried to help Russia rejoin the community of nations. If Russia were prosperous, strong and self-confident, America would have benefited—just as it did when Germany and Japan became rich democracies after World War II. Ironically, the U.S. economy is now likely to gain from the new Cold War. Vladimir Putin miscalculated. He gambled that the U.S. would shrug off his annexation of Crimea the way it had Russia’s war against Georgia in August 2008. But the Russian president didn’t take into account the changed dynamics in Washington. Back then, the U.S. was in no position to respond decisively. George W. Bush was a lame duck, limping toward the end of his second term. The presidential campaign was in full swing and the U.S. economy was crumbling; the financial crisis broke out in early September. By the time Barack Obama was inaugurated in January 2009, Russia was completely off America’s radar screen. On the surface, the U.S. seems even weaker now. Obama’s popularity is consistently low, most recently because of problems with Obamacare. According to Gallup, his 43% approval rating is well below the average for past presidents at the same point of their tenure and close to his own October 2011 nadir. He has barely been able to govern against determined opposition from the Republican-controlled House of Representatives. The President’s domestic problems have been compounded by ineffectual foreign policy. A Quinnipiac poll in early April gave him one of the lowest presidential ratings ever on foreign policy, a negative 39-55%. Ukraine now leads the list of voters’ concerns, and 36% believe that Washington’s response to Russia’s actions has not been sufficiently tough. The Republicans have been attacking Obama’s foreign policy even before the Ukraine crisis. Putin has handed them a perfect stick with which to beat the White House in the run-up to the November mid-term elections. Obama is especially vulnerable on Russia, having launched a “reset” policy in 2009 and having been outwitted by Putin on the issue of Syria’s chemical weapons last year. Moreover, the Republicans suddenly see a clear path to the White House for a war president, just as Ronald Reagan rode the Iran hostage crisis and the Soviet invasion of Afghanistan in the 1980 election. The Democrats, in turn, are feeling the heat to show some backbone, and they are putting pressure on Obama, as well. Ironically, the Democrats’ dovish reputation in military matters often spurs them into action. All military conflicts of the 20th century except for the First Gulf War were initiated by Democratic presidents. And then there is the economy. Even as it completes its fifth straight year, the economic recovery remains sluggish. Weakness has been especially pronounced in the labor market. Only recently has the number of U.S. jobs marched the 116 million mark seen in late 2007. Since that time, the population increased by 15 million. The participation rate, or percentage of working-age Americans working or actively seeking work, declined by three points, from over 66% in 2007 to around 63% now. The recovery lacks sustainable sources of growth and remains dependent on deficit spending and on the Federal Reserve, which continues to add liquidity to the financial system. Last year, the Fed added a trillion dollars as part of its bond buying program. Since March 2013, automatic spending cuts, known as the sequester, reduced the Federal budget gap while the Fed, realizing that it can’t go on printing money forever, has started to reduce monetary stimulus. Suddenly, the specter of another downturn, or economic stagnation, emerged, spooking stock investors. This is remarkably reminiscent of the Great Depression, to which the Great Recession of 2008 has been compared. Back then, after FDR’s victory in 1932, the federal government also boosted public spending, for a time spurring economic growth. However, the recovery began to sputter by 1937, with the jobless rate still hovering around 10%. It rocketed toward 20% the following year as the effect of public spending evaporated. The Depression ended only in the run-up to World War II. Once the war began in earnest, the ranks of the military swelled to some 10 million, creating a labor shortage and sending millions of Rosie the Riveters to the factory floor. In the 1980s a less massive but still substantial military buildup helped the U.S. economy shake off the stagflation of the previous decade. It was a root-and-branch reform of the U.S. military, propelling it into the new, electronic age, and Pentagon contracts were instrumental in spurring growth in Silicon Valley and laying the foundations for the IT revolution of the 1990s. One of the key bipartisan decisions likely in nearby months will be a reversal in spending cuts in the U.S. defense budget. Last year’s sequester reduced spending at the Pentagon by $37 billion, and in the current fiscal year there is another $50 billion in cuts. The $496 billion budget request for the year running through Oct. 1, 2015 was prepared before Russia’s invasion. The U.S. will now need to rethink the national security doctrine of the past quarter century, boosting its military presence in Europe and Central Asia and increasing support for its NATO allies. A review of spending priorities is also due in Europe. After the end of the Cold War, defense spending in most European countries collapsed and NATO’s fighting capabilities were provided almost exclusively by the U.S. The wars in Iraq and Afghanistan didn’t change the situation. Following Russia’s latest moves, Europe has already started to see the wisdom of having its own military deterrent capabilities. Eastern and Central European countries sharing borders with Russia and Ukraine are leading the way in this rethinking. During the Cold War, the Soviet Empire was separated from the rest of the world by the Iron Curtain and it did very little business with the West. The Soviet Union and its allies produced almost everything they needed and were impervious to economic sanctions. Communism collapsed only when the Reagan Administration forced Moscow into a massive arms race, which the weak Soviet economy could not sustain. Russia’s economy is considerably weaker and more precarious than its Soviet counterpart. Since the collapse of Communism, Russia has lost most of its industry, and much of what currently exists is dependent on imported machinery and components. It needs international markets, notably in Europe, to sell its oil and gas and to earn hard currency to pay for imports. At the same time, Russia’s banks and natural resource companies rely on international markets to raise capital. This makes Russia doubly vulnerable: On the one hand, its economy can be hurt by economic sanctions and export restrictions, and, on the other, it is a hostage to developments on global oil and gas markets where it earns 70% of its hard currency and which provide over half its budget revenues. Trends in international oil and gas markets have already been moving against high-volume producers such as Russia. True, Western Europe still depends on Russian natural gas for some 30% of its needs, but new sources of supply, notably new fields in Israel and Kuwait, as well as U.S. liquefied natural gas and European shale deposits, can reduce this dependence substantially. The Obama Administration promised to open up exports of U.S. LNG to Europe as part of the early response to Russian aggression against Ukraine. The U.S. could do a lot more to increase domestic oil production while also developing energy-saving technologies and alternative energy sources. All of this, starting with the military buildup in the short run and investment in the energy sector over the longer term, will bolster the U.S. economy. On the other hand, Russia—which according to some calculations needs oil at $117 per barrel to stay solvent—is dangerously exposed. Thus, Putin, who invaded Crimea in order to showcase Russia’s newly found self-confidence and to point up U.S. weakness, may achieve exactly the opposite: bringing about a severe economic crisis in Russia while bolstering American economic might.